When the air outside begins to nip, and the rest of the neighborhood is adorned in twinkle lights and strands of garland, my childhood home would fill with the smell of oil and crisping potatoes as my mother, Emily Angel Baer, transformed into the Latke Lady. I come from a very big family in Memphis, Tennessee and we filled the eight days of Hanukkah by celebrating with different parts of our family each night. 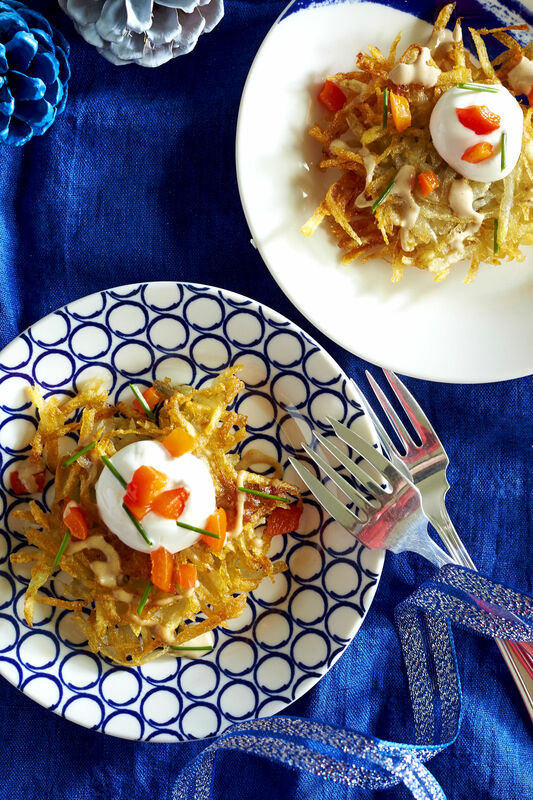 Each of these celebrations took place in various homes of cousins, aunts, uncles, or family friends—the one constant was my mama’s potato latkes. No one makes them better, so it just became tradition that my mom made them for everyone. Tradition is very important in the Jewish religion. A lot of what is considered our observance of holidays isn’t mandated in the Torah, but rather they are traditions that are passed down, generation to generation. The latkes themselves are one such tradition. We eat them on Hanukkah as a symbolic nod to the oil that should have only lit the temple for one night lasted eight miraculous nights. 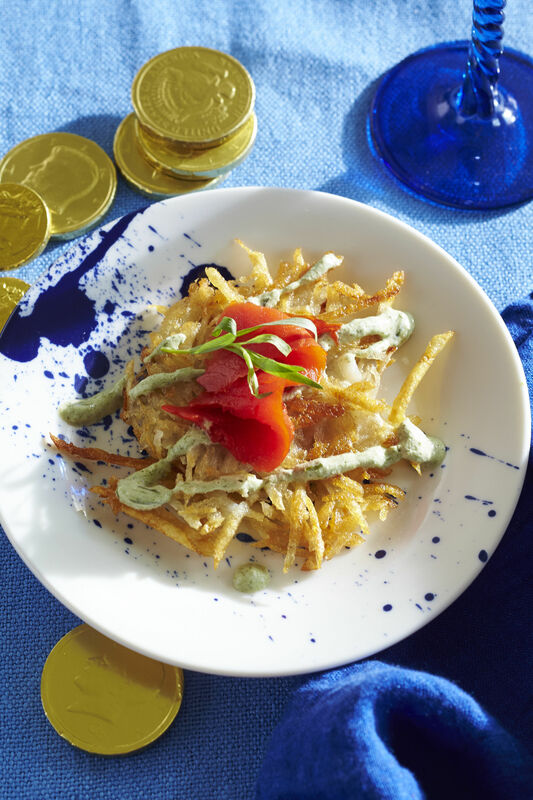 In fact, it’s really more about eating fried foods in general than the latke specifically. Some families celebrate with sufganiyot, or doughnuts, rather than the latkes. In my family, the recipe we use for our latkes can be traced back generations to Russia. My grandmother was the youngest of seven children, and the only one not born in Russia. Her mother, my great grandmother, Tamara Tiba Malkin, made latkes with this recipe and when my mother was a child, Tamara Tiba passed on the responsibility to her eldest daughters, my great aunts, who carried on the tradition. My great Aunt Mary, whom I remember fondly as a real spitfire, passed the recipe onto my mother and my mother has recently taught me to make this beloved family dish. This year, she is allowing me to share her secrets with all of you. Spoiler alert: she has the perfect trick for making the latkes ahead but having them taste like they were just pulled out of hot oil the minute you serve them. This saves a lot of stress come party time. Believe me! My mother is an extremely organized person, all of the time. She has a process for everything, and making latkes is no exception. Before she even begins, she has meticulously covered the counter tops with newspaper, the brown paper bags you get at the grocery store, and paper towels as a landing spot for the latkes to drain some of the excess oil off once they are removed from the hot pan. She also has all of her ingredients out and portioned out and in prep bowls, lined up neatly in uniform rows like soldiers in formation before she begins. No frantic running to the fridge or pantry mid-process. No way, not Mom. One of the biggest differences in the way Mom makes her latkes to the way others do it is that she makes a batter, similar in texture to a pancake batter, rather than shredding her potato and onion. She lets her food processor do the work there. Mom fills her largest skillet with oil until it’s about 1/3 of an inch deep and patiently waits for the oil to get good and hot. She says that when you put the batter in the oil, do it slowly and leave the spoon in until the batter is into the oil completely and evenly. She then flips when the edges begin to brown. For the rest of her tips, you can read the full recipe here. When your latkes are ready to serve, don’t forget the apple sauce and sour cream. 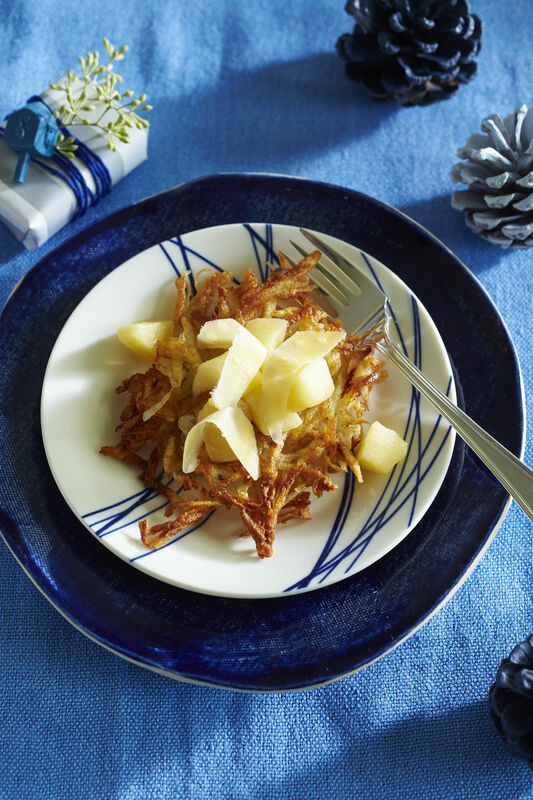 No latke is complete without one of those two traditional toppings. From my family to yours, Happy Hanukkah! And thanks Mom!